European Union leaders have stressed the need for unity at a celebration in the Italian capital marking 60 years since the Treaty of Rome was signed. Twenty-seven European Union countries, not including the UK, signed a new declaration to honour the 1957 treaty, which led to the bloc’s foundation. With Brexit looming, UK PM Theresa May is not attending the celebrations. European Commission head, Jean-Claude Juncker, spoke of a new mood of optimism about the way forward. “The atmosphere is now such that we can approach this with confidence,” he said, referring to the future of the bloc as Britain leaves. Mrs May plans to launch the Brexit process on Wednesday. On the Capitoline Hill, where the six original states signed the Treaty of Rome on March 25 1957, the 27 leaders put their names to a declaration of unity. “Prove today that you are the leaders of Europe, that you can care for this great legacy we inherited from the heroes of European integration 60 years ago,” European Council President Donald Tusk said. The celebratory summit comes as the EU faces a range of challenges, including Brexit and the rise of populist parties. Pro- and anti-EU protests are taking place in several member states. Thousands gathered for a march in London against Brexit; and in the Polish capital, Warsaw, thousands took to the streets to show solidarity with the EU. 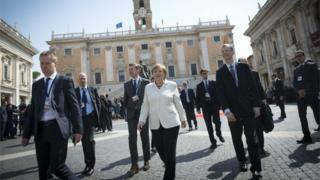 But in Rome, the Eurosceptic Fratelli d’Italia party marched to highlight what it sees as trade inequities in the bloc. Rome is also expected to witness pro-EU demonstrations. Security has been tightened across the Italian capital following Wednesday’s terrorist attack in London. Pope Francis welcomed the leaders to the Vatican on the eve of the summit. In a speech, he said that all bodies risk dying if they do not look ahead, and thus urged the EU to approach the future with renewed vigour. He also warned against “false forms of security” promised by populists who want to wall themselves off, and instead urged greater solidarity. The original Treaty of Rome launched the European Economic Community, the EU’s forerunner. It was signed by six countries: Belgium, France, Italy, Luxembourg, the Netherlands and West Germany. The US was among those countries that sent congratulatory messages to EU leaders. “Together we look forward to another 60 years and more of shared security and shared prosperity,” read the White House statement. President Donald Trump has more often been critical of the union, calling Brexit a “good thing“, and predicting more countries will follow suit. In a new Declaration of Rome, the 27 countries are reaffirming their shared desire to continue with what is a greatly expanded and deepened union. But there are huge challenges. The UK’s looming exit is the Union’s biggest setback ever. And after a decade of crises and sense of growing threats at home and abroad, European leaders are looking for ways to reinvigorate their project, but struggling to find a united way forward.